WASHINGTON — Newly inaugurated President Donald Trump was "directly involved" in the search for the person who, using the official National Park Service account, retweeted side-by-side comparisons of the crowds at Trump's Jan. 20 inauguration ceremony and former President Barack Obama's 2009 ceremony, CBS News has confirmed. The retweet was deleted soon after it was posted and the Twitter accounts of the National Park Service and other U.S. Interior Department agencies were briefly shut down. White House Press Secretary Sean Spicer told CBS News two days later in an email that the White House neither demanded the retweet be taken down, nor ordered the Interior Department accounts to be suspended. But emails released by the National Park Service in response to a Freedom of Information Act request reveal that the new president was "concerned" about the retweet. "Obviously, this has become a very sensitive issue, especially since the President has gotten directly involved and contacted Acting Director Mike Reynolds concerned about one of the images that was retweeted," wrote Tim Cash, Chief of Digital Strategy at the National Park Service in a Jan. 21 email to Shaun Cavanaugh, the agency's Chief Information Security Officer. The email between Cash and Cavanaugh was first reported on by the news site MuckRock. A White House spokesperson did not return a request for comment about Cash's depiction of Trump's involvement. The Freedom of Information Act request also includes a memo detailing the efforts National Park Service staff took to track down the rogue retweeter. "We traced the IP address used for the two questionable posts to an ISP in the San Bruno, Calif., area and checked all possible NPS social media points of contacts in that area," a staffer wrote in the briefing. The agency initially "suspected that this incident was an accidental cross-posting from a personal Twitter account (this has happened on multiple occasions in the past with other NPS social media accounts)," but later became concerned that an account was compromised, according to the memo. After the retweet and ensuing news coverage of its deletion, the size of the crowd at the inauguration became one of the dominant news stories of Mr. Trump's first days in office. In Spicer's first press briefing after the inauguration, he chastised journalists for their coverage before leaving the briefing room without taking any questions. That same day, the president complained about the crowd size coverage while standing in front of the CIA's Memorial Wall, a monument to CIA officers killed in the line of duty. 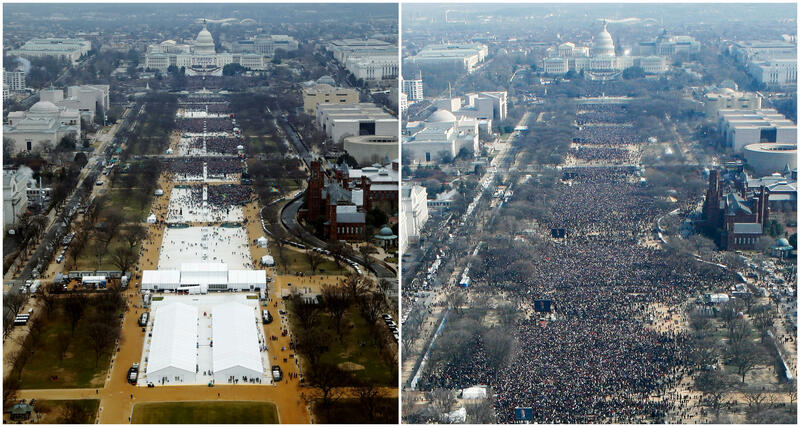 While the NPS no longer releases official crowd size estimates, aerial photos show fewer people at Mr. Trump's inauguration than former President Obama's first inauguration in January of 2009, which drew an audience of 1.8 million in the nation's capital. Metro ridership showed 193,000 rides taken by 11 a.m. on the day of Trump's inauguration, compared to 513,000 in 2009 for Obama's first inauguration, and 317,000 for his second swearing-in.